CLOTH & KIND'S INSPIRATION // We selected the Soft Focus color palette, which spoke to us both at our core, and almost instantly conjured up images in our minds of an artist or collector's studio. Soft Focus is a stellar collection of hues that represent a place between pastels and mid-tones. Subtle and/or muted, sometimes described as 'smoky' and pleasingly versatile, they are often married to a variety of other like shades. Whether in striated, layered or veiled patterning where, when used in combinations, one color blends effortlessly into one another. We've been fans of Caroline Cecil Textiles ever since we were first introduced to Caroline at the Bradley showroom in Atlanta during Design ADAC week. When we got a sneak peek of her new designs and asked if she'd be interested in including a couple of them (TITIK & HUTAN) in our Pantone vignette and she enthusiastically said yes, we knew the design was taking shape just as we wanted. We couldn't wait to use TITIK all over the walls, in true CLOTH & KIND fashion, as a textural backdrop to for the art, and HUTAN seemed as if it was made for Palecek's Strings Attached chair, no? The AmericasMart showrooms and vendors were all wonderful about allowing us to pull from their inventory to create the space we imagined. Special thanks to Currey & Company for the chandelier, Eliko for the gorgeous vintage kilim rugs, Palecek for that spectacular chair, Go Home for the hide chair and desk, and Golden Oldies for so many of the interesting pieces that made the space look truly layered and patinaed - just the way we like em! Also, a huge shout out to Zoe Bios Creative whose artwork we incorporated. We would have used more had we had the wall space! Much of the art also comes from our CLOTH & KIND vintage collection. 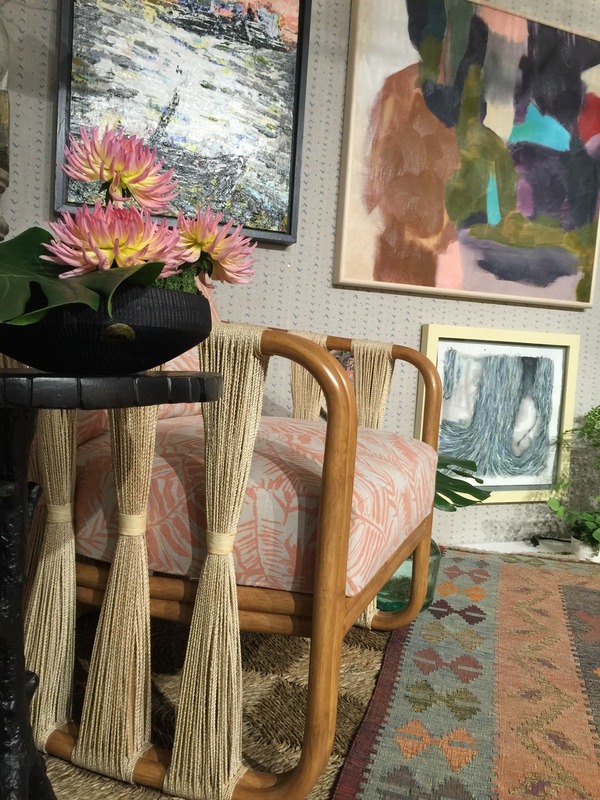 Be sure to check out the other gorgeous vignettes created by the talented interior designers that participated in the Pantone Design Exhibition including Janie Hirsch, Heather Hogan Roberts, Shaun Smith, Michael Habachy, Robert Leleux, Jamie Durie, Michel Boyd & Kristin Alber. Thank you again to all of our creative partners and showrooms that made our artist's studio spring to life.